1937-38 O-Pee-Chee V304E Hockey is the fifth and final series from the company for the decade. The set brings back the color but drops the die-cut gimmick used the year before. They also return to using a short player biography. Fronts feature a black-and-white player image superimposed against background with generic hockey-related artwork. A serrated design around the edges forms a blue or purple frame. Cartoon players in the background and the player's facsimile autograph share the same color used in the border. On the back, a short biography about the player appears in English, along with a French translation. Along the bottom is a line that identifies the series and card number. There are 48 cards in 1937-38 O-Pee-Chee V304E Hockey. They're numbered 133 through 180, continuing the numbering scheme established from OPC's first set. 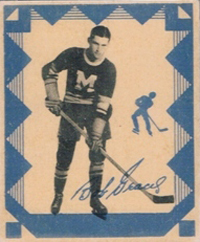 Issued during the 1937-38 hockey season, they are among the last of Canada's pre-war cards. Key players in 1937-38 O-Pee-Chee V304E Hockey include Toe Blake, Aurel Joliat, Turk Broda and Charlie Conacher. 1937 38 O-PEE-CHEE V304 SERIES E HOCKEY CARD #133 TURK BRODA KSA 2 GD OPC NICE!! 1937-38 OPC V304E RUSS BLINCO #169 EX EX+ Montreal Maroons LOOK ! 1937-38 V304 O-Pee-Chee Series "E" hockey wrapper. Type 1. High grade.